For fusion experiments of starting material a Naber box furnace is currently in operation. 1 Heraeus muffle tube with 100 mm muffle tube diameter is used for tempering purposes. 1 GERO high temperature muffle furnace is equipped with a Mettler AE 100 high precision laboratory balance for in situ density measurements of melts (Archimedean principle). 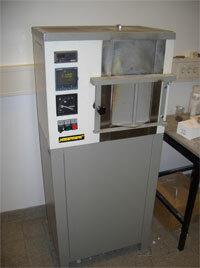 1 DELTECH furnace equipped with a Brookfield viscosimeter D-VIII head is used for standard rheology measurements. 2 electric driven agate mills can be used for sample preparation and synthesis of starting powders. The lab is equipped with various tools for machining, cutting and polishing of samples obtained during fusion processes. 1 furnace is equipped with a Mettler Toledo 104 balance for in-situ density determinations. 1 furnace is equipped with a splash quench apparatus for extremely high quench rates (>104 K/s). 1 furnace is used for oxidation state determinations of various metals in silicate melts (Fe2+/Fe3+, Eu2+/Eu3+, Cu1+/Cu2+). Synthesis of geomaterials or glasses under controlled fO2 (oxygen fugacity) conditions are only one standard method routinely applied. 6 one bar furnace assemblages, including all necessary experimental infrastructure (gas mixing systems, oxygen sensor assemblages, etc. ), are reserved for element partitioning studies concerning moderately and highly siderophile, lithophile and chalcophile elements,. A new area of research will be the control of sulphur fugacity applying SO2 containing gas mixtures in planned partitioning studies to investigate this important parameter in respect to planetary segregation and core formation processes.